I spend much of my time drawing and painting from life. Shapes, colours, tones and volumes interacting with one another in the real world are intriguing and can inspire work that is infused with emotion. 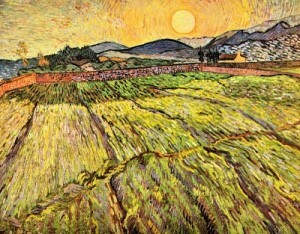 For example, think of Van Gogh’s landscapes, such as the one shown above. A fresh approach for me is to start with an emotion and then to build an image around it. Colours, shapes and symbolic forms can be used within the picture, and reference to living things is used as a tool rather than as a starting point. This way of working requires a “focus” of emotion to enable the artist to reach a meaningful conclusion. It is an extremely personal way to create a picture, and the process of planning the image not only documents the artist’s emotions, but can also help the artist to process and understand what they are thinking. I am currently working on a series of paintings following on from the death of my old dog, Freddy, but do please read on. While my initial thoughts on the subject were bleak, I am now finding (7 months on) that these pictures automatically fill with warm colours and are optimistic. None of these are completely finished, glazed or framed, and the final one is still rather at the sketch stage. I have decided to write something about them in this blog, even at this unfinished stage, to share some of the self-questioning behind the images. On trying to make sense of losing the dog in the first few days, the image in my “mind’s eye” no longer placed him in the real world in a logical fashion. Having previously done so many sketches of him lying on the floor, or next to a table, or resting in the garden, I could now no longer think of him and his surroundings as being predictable volumes. 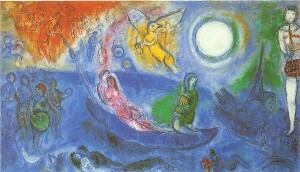 My visual understanding of the situation reminded me of Chagall paintings, with figures, trees, land and sky no longer connected in a real, three-dimensional sense but distorted and curled around one another, and with colours relating more to emotion than to the effect of light on the objects. Deciding to paint a picture based on the subject of pet loss has forced me to grapple with ideas about identity, death and memory. If we have visual images relating to such subjects, they may be floating, fleeting, distorted and continuously changing. How should one “pin down” these images and paint them within the confines of a traditional rectangular canvas? 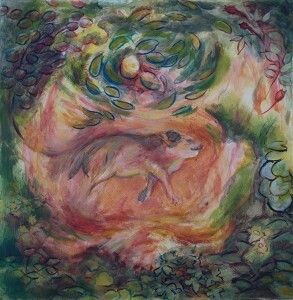 My first thought was to create an image of the dog beneath the garden with plants flourishing above and around him. 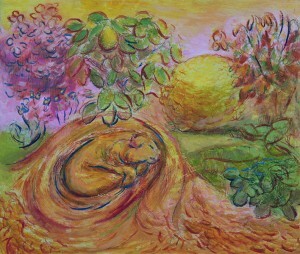 I had thought of making a series of similar pictures of the same garden and the same body as the seasons changed, perhaps one with roots curling down and shoots coming up, one of an over-lush intensely green summer, a painting with the warm colours of autumn and one under a blanket of snow. I was interested in the thought of a body having a permanent “resting” place, while life went on around it. However, my first attempt, “Freddy is in the garden: Autumn”, made me think and reconsider. Thinking clearly and logically, I knew that the dog was now a lifeless, unfeeling but still perfectly three-dimensional body, and was buried in my garden. Whereas, when he was alive, the answer to the question “where is Freddy?” would of course have been to point at his body, now I am not so sure. Yes, the body is still “Freddy” in one sense, but we could also now think of it as a decomposing, lifeless, “empty” thing, and not “Freddy” at all. In discussing this recently, a friend described a buried body as an “empty vehicle” and, yes, this rings true with me in some way. This is a typical posture of a relaxed, sleeping dog. It is soothing for us to think of a dead body in a sleeping position. 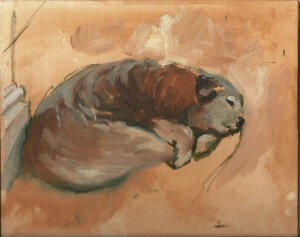 But now I questioned myself: Perhaps the creation of a pleasing image is not a good enough reason for me to paint him curled up? Indeed, he was even unable to lie curled like this in the last few days of his life due to arthritis and spinal pain and, after death, would anyway be crushed under a weight of earth. My curled, resting image harked back to an old memory rather than relating to an actual dead dog. Had I painted a lie? Had I been too dishonest in showing a sleeping, happily curled dog underground? Another option would be to paint a squashed, rotting body – would that be more honest? If I insisted on painting “what is physically there in that place” then, yes, perhaps I would need to show an actual decomposing body. But what I had really set out to show was not an empty, anonymous, decomposing “vessel” but this particular individual dog, a representation of his identity or of his “Freddiness”. An image of his rotting body would no more show “him” than would a clipping of his fur, or a little collection of his dropped milk teeth, or a vial of his blood taken last year and stored (don’t worry, I don’t have that final one!). Also, consider this: On the microscopic level, a dead body is gradually absorbed by surrounding micro-organisms and “taken up” by the garden. The plants consequently absorb the released nutrients and grow but of course they do not assume the identity of the dead dog. Insisting on using the body as a representation of identity becomes more problematic the more I consider it. In my opinion, to suggest the dog’s identity in the picture, an image from life is more helpful. To show this from my own point of view, a representation either purely from my memory, or based on a sketch that I had originally made myself, would be more appropriate than one copied from a photo. As for showing him in a sleeping position, this is interesting in itself and could inspire some discussion. It is almost instinctive to curl a pet up into a sleep-like position before burial. This says more about us as living people than about them as dead animals. Taken as the final word on the subject, the concept of my painting, “Freddy is in the Garden (1): Autumn”, is perhaps flawed. However. I have concluded that it is worthwhile as part of a series of images. The curving lines that echo one another are there to represent the cycle of natural decay and regeneration which I certainly do believe in (i.e. the decay of dead bodies allows plants to flourish, and further animals then feed on the plants). The lyrical, curved shapes, the warm colours and the comfortable representation of the dog create a picture that is easy to look at. In painting this, I am not trying to say that death is a great comfort or that an underground grave is a warm and pleasant resting place. The warmth of this picture draws the viewer in and gives them a chance to wonder for themselves about this subject. Rather than making people flinch away, anyone can look at this and think and talk, even young children. So it seemed that this picture had more to do with memory (mine) and identity (his, as seen by me) than to the physicality of death and burial. After picking up a second-hand copy of a book about Expressionism, I decided to make a “memory picture” of the dog in the house, perhaps suggesting the way in which an old dog seems to become part of the room and how, when gone, they leave a strange and awkward gap. This was based on an oil sketch made earlier in the year from life. Interestingly, I found myself drawn to using plenty of pinks in this image. There is currently a huge cultural push insisting that “pink is for a girl”. That is not why I used pink here. I liked the warmth of the colour, and the way in which I could flood the inside and the outside of the dog (the background floor) with the same pink. This has led on to another “memory picture”. If the inside and outside of the dog can be flooded with the same colour, then how about taking this to another stage and just showing him as an outline? In the painting, below, he has almost become a symbol. I do not believe in ghosts, but it is interesting how they are sometimes portrayed as tranluscent beings within a physical world, perhaps as shadow-less outlines. 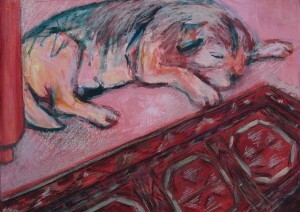 The dog in the above painting was copied from a pen drawing from one of my old sketchbooks. 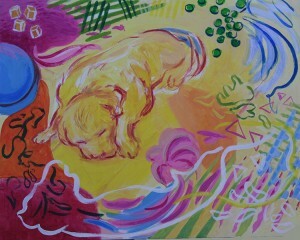 Inspired by Matisse, I felt free to use colours and patterns of my own choice around him. Some of the squiggly lines are copied from lively sketchbook drawings of my children. In the original sketches, these lines represented folds of clothing or bits of arms or legs. Other shapes hint at food treats or toys. I aimed to suggest a dog in a living room surrounded by mess and typical lively family chaos, but also enjoyed adding and overlaying shapes and patterns to balance one another in an abstract sense across this painting. For my next picture, I have returned to the thought of a dog who has lived and died and who now has a place within the garden. Rather than attempting to show a static image of dead body, or a ghost, spirit or visible soul, I am aiming to keep this picture very ambiguous. I started the painting in a very “loose” manner, and have deliberately left it unclear as to whether the dog is remembered as alive or dead, resting or dying as seen from above, or perhaps even running as seen from the side. There is also ambiguity as to whether he is represented in a hole in the ground, resting on the surface of the land or, perhaps, hovering. As for representing the garden in the above picture, I have suggested patches of light and shade and, in some places, I am painting plants that really do grow in my garden. Some are painted as seen from above, and others are perhaps viewed from the side. The quince grows in my garden and is used here as a symbol of long-standing plant fertility and for the warmth of its yellow colour. The aim is to retain enough ambiguity for this painting to read as a memory picture rather than as a three-dimensional attempt at physical accuracy. From looking at the picture, the viewer should have a chance of understanding something of what I was thinking, but should not have enough information to make a three-dimensional sculpture of my image. One reason for sharing this small group of pictures is that they offer an interesting talking-point. They could be “read” simply as images of pet death, or these optimistic-looking pictures could open up thought and discussion around more terrible kinds of loss. These paintings have certainly made me question my own beliefs about identity, death and visual memory. If you have further ideas, comments, or differences of opinion, then you are very welcome to discuss by adding to the comments box below. This is so beautiful. You should include it in a book! I would want to reread it and refer to it from time to time and enjoy the glorious pictures. The aspect about life and death that comes across, too, for me is that we come alone and go alone – and it’s a big world, but it’s ok.